We’re back! Well, we didn’t REALLY go away–we’ve been cooking like usual for the past several weeks, including great dishes like Real Simple’s Linguine with Garlic, Soppresata, and Wilted Arugula and The Kitchn’s The Easiest Thai Green Coconut Curry—but we finally committed to make time to post our menu. 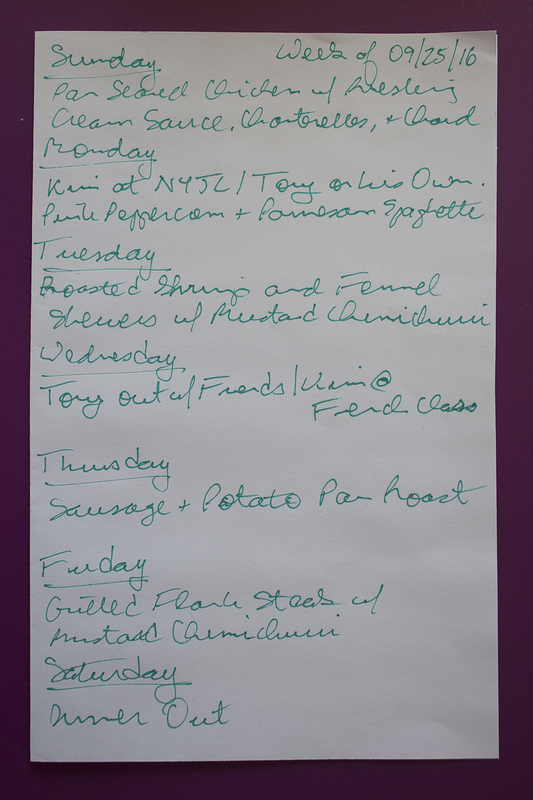 Tony was in charge of the menu this week, so the recipes are a bit more meat-focused than we’ve been used to over the past several months. They’re also almost exclusively from Food & Wine Magazine, which is just a happy coincidence. Sunday’s dinner is a recipe that we e-mailed to each other on the same day, maybe 15 minutes apart: Saveur’s Pan-Seared Chicken with Riesling Cream Sauce, Chanterelles, and Chard. Tony loves roasted chicken, Kim loves Riesling, and we both love mushrooms, so this dish was a no-brainer. The fact that fall has arrived in NYC and the temperature is cooling down made this dish even more attractive. We’ll pair this up with a 2014 Hexamer Riesling. Kim will be at a New York Junior League board meeting on Monday, so Tony will be on his own. He is going to keep it simple and make Food & Wine’s Pink Peppercorn and Parmesan Spaghetti, using the peppercorns we bought back from our recent rip to Nice, France. This dish is a variation on the classic Italian dish Pasta Cacio e Pepe (pasta with cheese and pepper) and has the dual advantage of being very easy to make and creating lots of leftovers for lunch during the week. Tony will have this with a Feudi del Pisciotto, an Italian red from Sicily. We’ll pick things up again on Tuesday with Food & Wine’s Roasted Shrimp and Fennel Skewers with Mustard Chimichurri. This is a pretty simple dish–you roast the fennel and then the shrimp while making the chimichurri–but we may make the sauce in advance just to save a step. We weren’t sure what kind of wine Branden at Columbus Wine & Spirits would choose for this dish (our friend Michael was out on Saturday, recovering from jet lag after a trip to Spain, the poor guy), and he surpassed us a bit by going with a French wine, specifically, a 2013 Marc Bredif Vouvray. We’ll both be out on Wednesday night, Tony with some good friends from high school, who convinced his Manhattan-centered mind that a trip to Brooklyn does not count as international travel and Kim at a French class so that we are prepared for any international travel that we do, so no cooking that night. One of Tony’s favorite dishes of his mom’s is a very, very simple one: roasted sausage and potatoes. He found a recipe (not that this simple dish really needs one!) for a dish that is basically the same thing. So, on Thursday night, we’ll have Food & Wine’s Sausage and Potato Pan Roast. This recipe uses shallots and arugula, so it will be a good bit different from Tony’s mom’s version. We’ll have this with a 2010 Vivanco Riserva Rioja. Friday night’s dinner will be the simplest of the week: Grilled Flank Steak and Mustard Chimichurri. No recipe required; we’ll just cook the steak on our trusty grill pan and use up the leftover chimichurri from Thursday. We’ll have dinner out on Saturday night, probably sushi, or maybe Indian, just to mix in a meal that doesn’t involve chicken, pork, or beef! And thus ends another week for Two at the Table!